Beautify the exterior of your house and help reduce heating and cooling cost at the same time with louvered vents. The most common wood to use on louvered vents is cedar. This lightweight and durable wood is easy to work with and requires little maintenance. 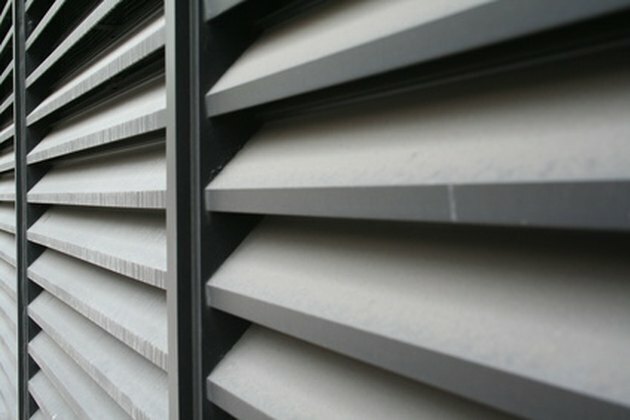 Gable vents and interior door vents are a couple of examples of louvered vents. You can paint or seal the cedar before installation to eliminate the need for taping off the area around the installation. Set the table saw fence on 5 inches. Turn the wheel on the table saw that adjusts the angle on the blade until you get a 45-degree angle. Rip (cut lengthwise) eight of the 22 1/2-inch pieces to that width. These are the louvers. Put some glue on the ends of the remaining 22 1/2-inch pieces and secure them between the 28 3/4-inch pieces with box nails. Clean up the excess glue immediately with a damp cloth. This is the frame for the louvered vent. Place one of the louvers inside the frame. Position it, so the angle is even with the front edge of the frame and is touching one end of the frame. Secure it with the box nails. Put the 1-inch block of wood on top of the installed louver. Place a louver on top of the block and secure it in the same manner as the first one. Repeat this with the rest of the louvers. Lay the louvered vent frame on its front. Secure the screen wire to the frame with a staple gun and 5/16-inch staples. Turn the louvered vent over. Build a picture frame with the remaining lumber. Set the electric miter saw on the 45-degree angle on your right. Cut one end of the 30- and 25-inch pieces. Measure from the inside of the angle on the 30-inch piece and make a mark at 27 1/4 inches. Move the angle of the electric miter saw to the opposite 45-degree angle. Cut the 27 1/4-inch mark. Next, mark the 25-inch pieces at 22 1/2-inches and cut them in the same manner as the others. Apply glue to the front edges on the louvered vent frame. Attach the angled pieces to the front of the vent with the finish nails. Clean up excess glue with a damp cloth.